True enough, and GeoDesign has been a GIS application area that’s been of high interest at Esri with early forays into GIS and design software development dating back to the introduction of ArcCAD in the early 1990s and ArcSketch in 2005. ArcGIS 10 marked another milestone in that evolutionary process, with true 3D data management and analysis tools really maturing at that release. But still there was a need for more content, and the need to generate it easily from existing 2D GIS data by using attributes and applying rules. Part technology and part workflow, GeoDesign brings planning, design, and GIS together resulting in more open participation through visualization, better evaluation of proposed scenarios, and a deeper understanding of the implications of one design over another. The combination of GIS and design seems like it was inevitable and obvious now, combining the strengths of data management and analysis with a strong design and automation component, all based on a framework of existing authoritative geographic information. The acquisition was significant for a number of reasons, not the least of which being that Esri rarely steps outside its own walls to gain new technology, preferring to grow it from the inside. But in this case it was a natural marriage of two complementary companies with complementary goals and ideals. And it was also a milestone in the evolution of an integrated 3D GIS and GeoDesign platform. Nathan Shephard, lead 3D visualization product engineer, explained to me in his office the other day that the idea of bringing the two companies together was catalyzed by a joint project in Rotterdam last year. The goal of that effort was to use the city’s GIS database to generate a 3D model for planning and design, centered on the construction of several bold and distinctive buildings in the heart of the city. The goals were to better evaluate the design, create a way to experience the design beforehand, and enable residents and citizens to become better informed about the planned development to facilitate feedback. Shephard explained that as the project evolved it became obvious that the technology match was excellent, and that the cultural match between the companies was equally good, ultimately leading up to the notion of bringing the companies together. The relationship is mutually beneficial. CityEngine benefits by being able to leverage Esri’s user base to gain a broad audience and integrate deeply with Esri’s GIS platform that provides data, tools, and a foundation for analysis. Esri gains by embedding 3D GeoDesign into core GIS, resulting in enhanced capabilities that can be applied to urban planning, military applications, and potentially much more. 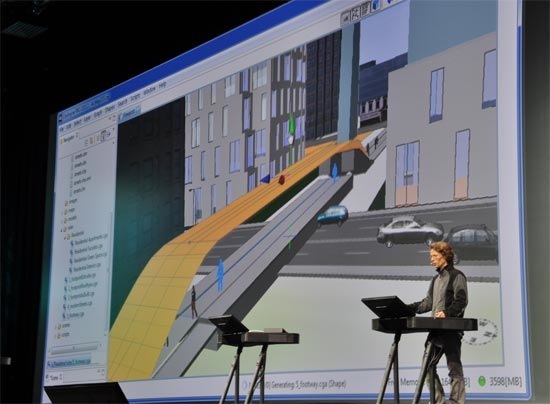 Gert Van Maren, 3D product manager, covered details about CityEngine and ArcGIS during his user conference presentation. It’s a great view into the rich landscape of integrated 3D GIS and GeoDesign. This entry was posted in Uncategorized and tagged 3D visualization, CityEngine, geodesign, Procedural. Bookmark the permalink.